This is not that new an item, but amazingly, it’s slipped through the blogging net until now! 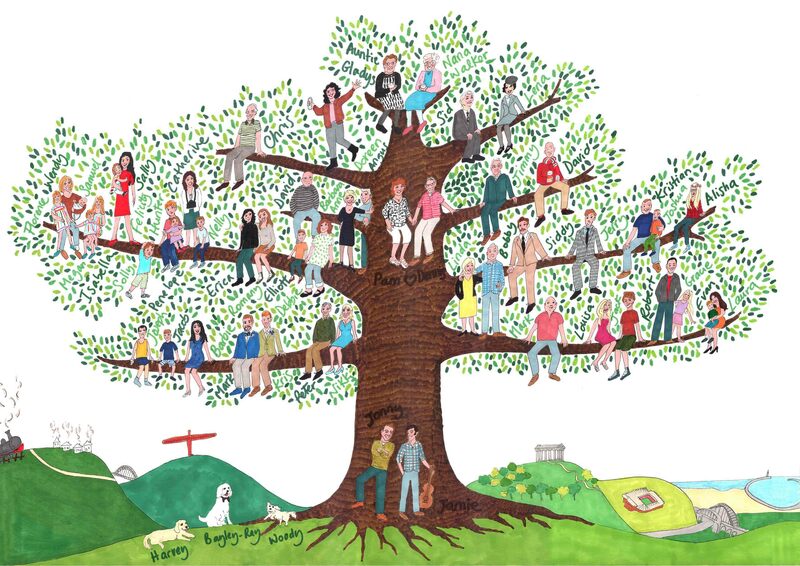 I am very proud of this tree, although I was mostly very daunted by the prospect of over 50 people to draw initially! But the thing is, ultimately, I really do like a challenge. And so it was here, with a tree spanning 4 generations across the mostly living, and a collection of beautiful people. It was also a first to draw some very specific landmarks – the Angel of the North, the stadium of light and the wonderful bridges of Sunderland, as well as a working steam train! You can see further family trees on my Etsy shop Karuski Colours – and find out more about how I work and my price list. Feel free to contact me on karuski@yahoo.com if you want to discuss ideas and get an accurate quote.